The Kenwood eXcelon DMX-7705S is the top of the line unit in vehicle audio-video applications with the most wanted features built-in. PLEASE NOTE THIS UNIT DOES NOT COME WITH A CD/DVD PLAYER, IT IS A DIGITAL MEDIA RECEIVER ONLY DESIGNED TO BE USED WITH YOUR iPHONE or ANDROID. WebLink (for iPhone & Android). Download the Kenwood WebLink app. And connect your compatible iPhone or Android smartphone via USB to access some of your favorite apps such as Waze, YouTube, and Yelp through the Kenwood DMX7705S. Your iPhone must be connected to the receiver's "black" USB port (not "grey"). Your Android smartphone can be connected to either USB port. Using these apps through the large, clear touchscreen of the DMX7705S makes WebLink a safe and easy way to access popular navigation, media, weather apps while in your vehicle. Integrates your iPhone® into the driving experience in a new, seamless interface, putting iPhone content at the driver's fingertips and voice commands with minimal distraction. Apple CarPlay is compatible with Apple iPhone with Lightning-connector (iOS 7.1+). CarPlay features Siri voice control and is specially designed for driving scenarios. It also works with the Kenwood receiver's touchscreen controls. The receiver supports the Android Auto app for Android smartphones running OS Lollipop (5.0 or newer). Connect your compatible Android smartphone to the USB port via through cable that came with your smartphone, plus be paired via Bluetooth. Android Auto extends the Android platform into your car in a way that's purpose-built for driving and automatically brings you useful information and organizes it into simple on-screen pop-ups that appear just when they're needed. Features of Android Auto include: Google Speech Technology, Google Maps, access to your contacts and messages through the Kenwood receiver while keeping your eyes on the road. Access your Android smartphone's music library through the Kenwood receiver via Google Play Music, Pandora, Spotify, iHeart Radio, & Tune-In. Allows you to make and receive calls from your smartphone or cellphone hands-free. It will also allow for media streaming from a compatible device (A2DP), so you can listen to music wirelessly. Now you can use your. IPhone's Siri to control the unit. Pairing your iPhone to the DDX unit is as simple as connecting it to the KCA-iP202 or KCA-iP103 adapter. You can play music from the Pandora music service using your connected Apple iPhone (KCA-iP202 or KCA-iP103 optional cable required). For Pandora App use, you may also use the USB cable that came with with your iPhone. The Kenwood`s screen will provide control over the Pandora music service and will display Artist, Album, and Song information. To access Pandora an Apple iPhone (iOS3 or later) with the latest version of the Pandora application (free from Apple`s iTunes App Store) is required. Stream Pandora from your Blackberry or Android device. And control it through SPP, just as if an iPhone was connected to the unit. A smartphone with an active Data Plan account with connection to the Internet via 3G/4G, EDGE, or WiFi and a Pandora music service account is required. The LCD screen is 7 wide TFT active matrix system 800H x 480V x RGB, and features an amazing graphic user interface, that is fully customizable. It features Touchscreen Control and comes with a beautiful. And customizable wallpapers and 3 skin selections, plus you can add your vehicle`s logo or other image. Maximum power is 50 watts x 4 through the integrated power amplifier (25W RMS x 4), and comes with 3 PreOuts (1 front, 1 rear, and 1 subwoofer)(5.0V) to add amplifiers and DUAL USB inputs that allows the connection of a thumb drive with MP3 files. 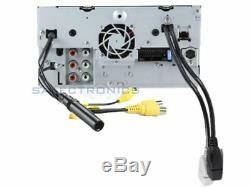 It has 1 sets of Audio-Video input (RCA Rear), 1 set of Audio-Video output (RCA Rear), and DUAL camera input (RCA Rear). Optional modules at additional cost. Satellite Radio (optional SXV300 module and subscription required for service). KCA-iP202 Audio/Video iPod/iPhone adapter apple devices with. KCA-iP103 Audio iPod/iPhone adapter apple devices with. 8 pin connector, no video. Steering wheel controller (PAC SWI-RC or similar). Rear View Camera (CMOS-210, Universal Camera or similar). The unit comes complete in the box with all wire harnesses, in-dash head unit, manuals, and external microphone. NOTE: This is a US/Canada model, as such, DVD is set to Region 1 only. Item Condition: Refurbished What does Refurbished mean? These products have been inspected, vigorously tested, components replaced if necessary, and repackaged complete with all original accessories just like new units. Refurbished car stereos that have removable faces do not come with the fabric carry case. Claims for damaged items during transit must be reported within. You MUST keep ALL packaging materials boxes, etc. And items EXACTLY the way it was received for carrier's inspection. Merchandise are accepted within 1 week of receipt of goods, and only with original tags, not used, in original box with all documentation and. Merchandise must be in resalable condition. Must be kept so the carrier can conduct their investigation. A we will try to troubleshoot the problem. Over 3/4 of claims can be solved by troubleshooting. B if we cannot troubleshoot the problem, the return will be approved. Products carry a Salectronics (that's us) for the length of time specified at the top of the listing. We do this in case the item will take too long to repair or is unrepairable. 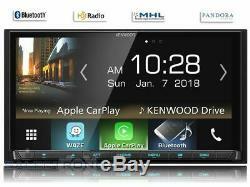 The item "Kenwood DMX7705S NO CD LCD Touch Screen Car Stereo 2DIN Android Auto/CarPlay" is in sale since Tuesday, October 9, 2018. 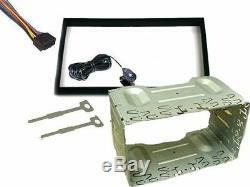 This item is in the category "Consumer Electronics\Vehicle Electronics & GPS\Car Video\Video In-Dash Units w/o GPS". The seller is "salectronics" and is located in San Diego, California. This item can be shipped to United States, Canada, United Kingdom, Denmark, Romania, Slovakia, Bulgaria, Czech republic, Finland, Hungary, Latvia, Lithuania, Malta, Estonia, Australia, Greece, Portugal, Cyprus, Slovenia, Japan, China, Sweden, South Korea, Indonesia, Taiwan, Belgium, France, Hong Kong, Ireland, Netherlands, Poland, Spain, Italy, Germany, Austria, Bahamas, Israel, Philippines, Switzerland, Norway, Saudi arabia, United arab emirates, Qatar, Kuwait, Bahrain, Croatia, Malaysia.